Entering the Recording Industry in 1995 at the age of 16, Carlos toured & recorded professionally with established recording artists from major & independent labels including Michael Salgado, Sisters Morales, Eddie Gonzalez, Grupo Rodeo, Jay Perez, Fama, Grupo Vida, Flaco Jiménez, just to name a few. Beginning in late 1998, Carlos began serving as a member of the internationally recognized musical ensemble, Mariachi Campanas De America. He received his Bachelor of Arts in Music Industry Studies from the University of The Incarnate Word (San Antonio, TX) in 2002. During his college years, he interned with several music publishers, and entertainment attorney David Garcia, Jr. From 2002 -2012 , Carlos worked at Seg-Son Music, Inc. overseeing licensing and song placement for the companies catalog. In 2004, He helped launched the corporation’s record label division, A.R.C. Discos, where he assisted in record promotion for 5 years. During his time there, he was part of two-man team responsible for placing 6 titles from the label catalog on Billboard’s Top 30 Regional Mexican Airplay chart, with “Como Olvidarte” peaking at #4 on the chart. Alongside this, the label received four Grammy nominations and two Latin Grammy nominations, with one GRAMMY Award. In October of 2012, Carlos moved to Azteca Music Group (Dallas, TX) overseeing the A&R, music publishing and digital distribution divisions of the company. With only four years as a label, Azteca has had 10 titles in Billboard’s Top 30 Regional Mexican Airplay chart, two that debuted #1 on their Billboard’s Top Latin Sales chart, and has received three Latin Grammy nominations, and one Grammy nomination. Since 1996 he has been a voting member of the Recording Academy (producers of the Grammy Awards), where he currently serves as President of the Board of Governors for the TX Chapter. He continues to perform with Campanas De America, is a BMI (Broadcast Music, Inc.) affiliated songwriter & publisher, In 2015, Texas Monthly selected him as one of their three “Modern Hispanic Gentlemen for his philanthropic work and service to the San Antonio community. 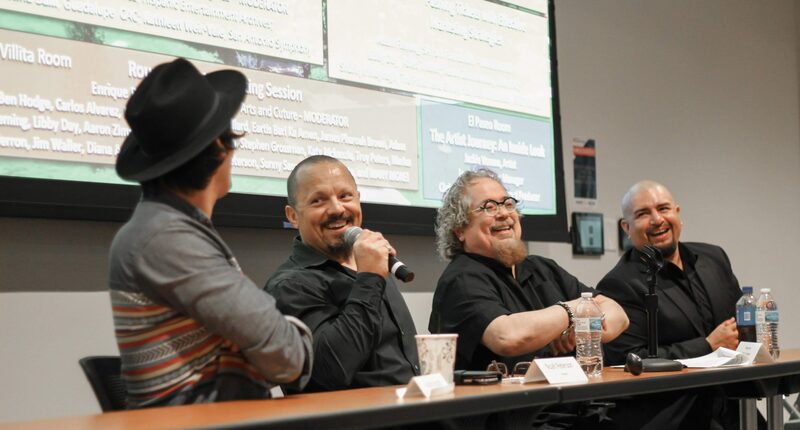 since 2008, he has taught the music publishing course at San Antonio College’s Radio / TV / Film department. Do not miss Carlos Alvarez at Music Biz Day on April 6th!